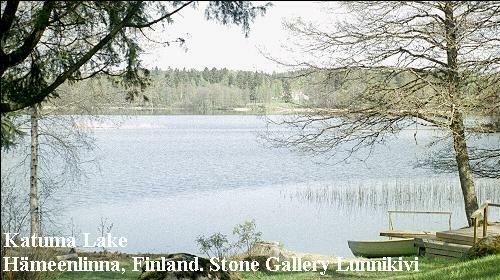 Stone Gallery Lunnikivi is located in historically remarkable culture milieu by Katuma Lake, near the center of Hämeenlinna. 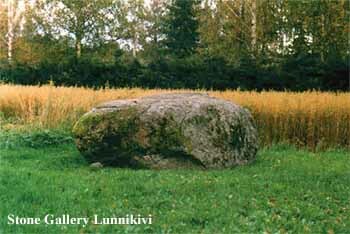 On the yard lies on its original position a car-sized Aunela sacrificing stone. It is brought there by several glaciations thousands of years ago. Hard granitic stones very rounded form indicates that it has travelled relatively long way here. 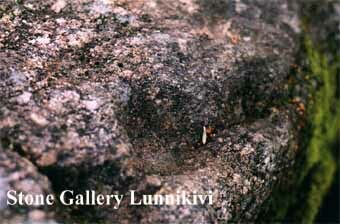 On the stone ancients Finns have sacrificed food and values to their gods. For that purpose they have hollowed 53 small cups to the stone that lies in a sacrificing grove. In the times of Swedish rule in Finland, in the beginning of the second millennium crusades were made to Finland. Finns were forced to forsake their old gods and become christians. Afterwards they repented of that and came to the Katuma lake and washed their baptism away and sacrificed again to their gods on the Aunela sacrifying stone. The lake got its name from this; Katuma is Finnish and means "penitence" in english. On the other side of the yard are still some visible traces from stone foundation quarry from 18th century. On near surroundings the bedrock is mostly covered by soil. It has previously forced people to use all possible loose stones around to make foundations to their houses and other buildings. In this old quarry lies still blocks with tens of small holes that are hollowed with wooden sticks and quartz sand using bare hands. To the holes people poured water in spring and autumn and let it freeze and break off blocks. The splitted stones were separated with forged iron wedges. The labour was tough and took quite a lot of time, but perhaps the way of life in the past was a bit calmer than today. In winter the blocks were transported with horse to where needed. In the beginning of 20th century Julius Konstantin Lundqvist founded in the site the first Finnish ennobling poultry farm and named the estate Tiparanta (freely translated: chicken beach). The first buildings were built in 1920's. 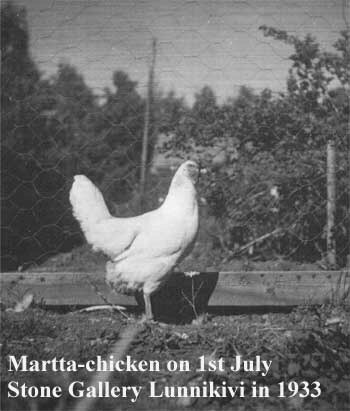 Below you can see the first three A graded chicken in the world, named Martta. The date is 1st July in 1933. After the end of the Second World War farming was continued by Eero, the son of J.K. Lundqvist. The Swedish sounding family name was translated to phonetic similar Finnish name, Lunnikivi. 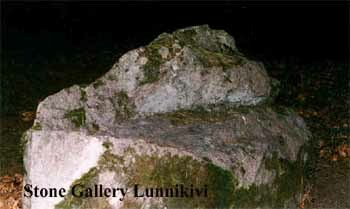 The surname is unique; all Lunnikivis belong to same family. In 1956 the farm was expanded with a new young poultryhouse. In there grew up at its most 7.000 young chickens. 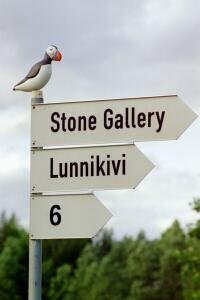 J.K. Lunnikivi has also brought many chicken-related words to Finnish language. Many of the words are still used in everyday speech. Ennobling poultry farm operation ceased in the middle of the 1980's when Eero Lunnikivi retaired. The young poultry house was only as a storehouse for almost ten years before in 1993 Pekka Lunnikivi, the son of Eero, moved back to his childhood home with his family and the building of Stone Gallery Lunnikivi begun. So, four generations of Lunnikivi family has already lived on this farm. At the turn of the 20th to the 21st century Stone Gallery Lunnikivi continues the long history of this site by building future. In connection with becoming acquainted with the Gallery it is also possible to arrange a tour to the historical places and to lecture history of the site.